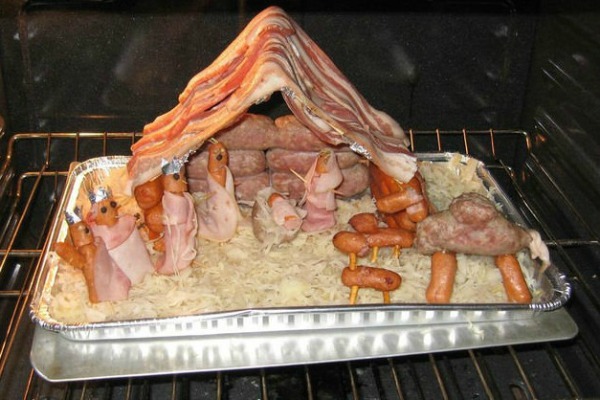 This photo of a bacon and sausage Nativity first made the rounds on Facebook last year after showing up on Buzzfeed. Who created it originally, we don’t know—but well done, whoever you are. After the 9/11 terrorist attacks, Laura Miller wrote a brilliant essay called “The Kitschification of September 11,” which appeared in Salon in January 2002. Miller discussed the blizzard of sentimental songs, memorabilia, and other crap that descended in the wake of the terrorist attacks and the way it epitomized a uniquely American cocktail of political and religious symbolism, economic hucksterism, and touchy-feely emotionalism, something that still permeates our national life over a decade later. In a culture that prizes emotion over logic and feelings over facts, the appeal of kitsch is obvious. And it’s always been part of American popular music. From the sentimental songs sang by Civil War soldiers to 70s hits like “Run Joey Run,” we’ve shown time and again that we’re suckers for songs that don’t merely tug at our heartstrings but yank on them like a dentist doing an extraction. And we rarely fall for it more enthusiastically than at Christmastime. Look, I get that Christmas is a sentimental time of year—I’m actually an old softie myself. But there are a few Christmas songs that cross the line from sentimental to maudlin, that play so shamelessly on the listener’s emotions that they become manipulative. They make you go “awwwww” instead of inspiring a more rational response, such as projectile vomiting. That’s Skip Ewing, a country singer who bagged a couple of hit singles in the late 80s. He released a Christmas album in 1990, but it wasn’t until its rerelease in 1995 that “Christmas Carol” started getting some traction on country radio, where its combination of high-grade sap and utter unreality proved irresistible, and still does. There’s an argument—one I’ve made before—that the purpose of art is to take us outside of ourselves and show us the world in a way we’ve never seen it. What makes kitsch the opposite of art is that it makes us want to believe in a world that does not exist, and cannot. The impulse to help little Christmas Carol is admirable, but you can’t do it with a simple phone call on Christmas morning. If it made listeners consider making the difficult commitment to and going through the hard work of adopting an older child in need of a home, that would be great. As it is, the “awwwww” response to “Christmas Carol” only lasts until the next song comes on the radio. You feel the emotion for a few seconds and then you’re off the hook. It’s what kitsch permits us to do.